In a move aimed at simplifying the development of end-to-end development of apps, IBM is the first cloud computing provider to enable the development of applications in native Swift. The next phase of IBM's roadmap brings Swift to the cloud with a preview of Swift runtime, as well as a Swift Package Catalog to help developers create enterprise apps. 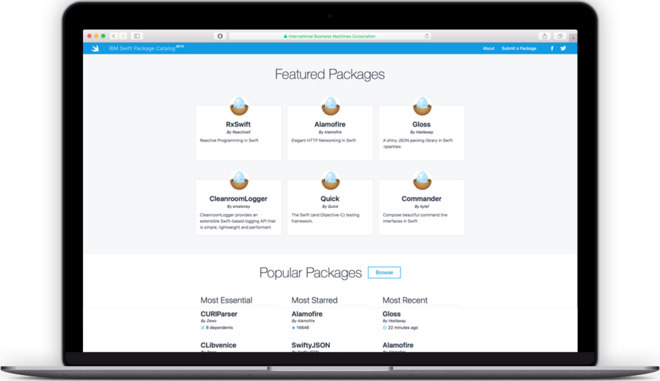 Develop and deploy: Start building end-to-end applications on Bluemix and quickly deploy them with Kitura, a new open source web server released by IBM, on both OS X and Linux. IBM touted its role as one of the largest users of Swift for mobile app development. Big Blue said its understanding of Swift and knowledge in assisting enterprises will maximize "the true potential" for server-side Swift. "Modern digital apps require a modern programming language. Swift is easy-to-learn, reliable, fast and interactive, the key traits that CIOs look for when building the next generation of enterprise mobile apps," said Michael Gilfix, vice president of IBM MobileFirst Offering Management. "Swift on the Cloud is an opportunity for enterprises to radically simplify the development of end-to-end applications and therefore reach new levels of productivity." According to IBM, bringing Swift to the server will break down barriers between front-end and back-end development. This will enable enterprises to use a single language to build rich experiences and back-end business logic. Swift on the server will also allow developers to have a simpler and more secure toolchain for end-to-end creation of applications. Apple and IBM laid the groundwork for Swift development in the cloud last December, when Apple made Swift open source, and IBM introduced a simple browser-based way for developers to get started writing code.